One of the things I love about history is the connections you can make to the past. This past week, Harriet and I made a connection all the way back to the Declaration of Texas Independence through Noah T. Byars, who is buried in Brownwood’s Greenleaf Cemetery. 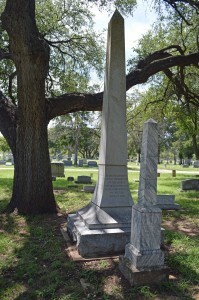 A South Carolina native and subsequent Georgia resident, Byars came to Texas in 1835 and settled in Washington-on-the-Brazos, where he operated a gunsmith and blacksmith shop and became one of eight charter members of the very first Baptist church in what would later become Texas. In 1836 when the residents of Texas declared their independence, the committee that drafted the document did so in his blacksmith shop and met with other delegates in a building he owned to adopt the declaration. 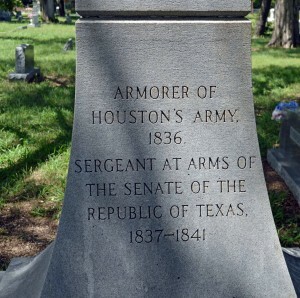 Sam Houston subsequently appointed him armorer and blacksmith of the Texas army. After Texas became an independent nation, Byars felt the call to the ministry and was ordained as a Baptist minister on October 16, 1841. The ordination was attended by Texas President Mirabeau B. Lamar as well as members of his cabinet. Two years later Byars was named the Texas Baptist Convention’s first missionary, ministering to the sparsely settled region between the Trinity and Brazos rivers. 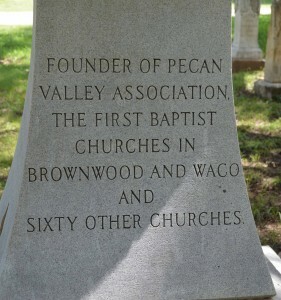 Over the course of his ministerial career, he founded more than 60 Texas churches, including the First Baptist Church of Waco in 1851 and in 1876 the First Baptist Church of Brownwood, where he lived out his life and died in 1888. So, what’s the connection? When Harriet and I married in 1971, we did so in Waco’s First Baptist Church, one of the earliest of the five dozen Baptist Churches he established during his career. We all have such ties to our past, if we just look for them.